← What’s in a Strikethrough? Vagrancy was a nearly constant background issue throughout the eighteenth and early nineteenth centuries. It shows up all over, in legislation about internal passports, in newspaper notices announcing arrested vagrants, in state concerns about what people are doing. I particularly like Simon Franklin’s description of why vagrancy was seen as such a problem: in his words, “vagrancy was abhorrent, dangerous, and wasteful,” as vagrants were at best lazy, and at worst were criminals. In 1842, there was a crackdown on vagrancy. 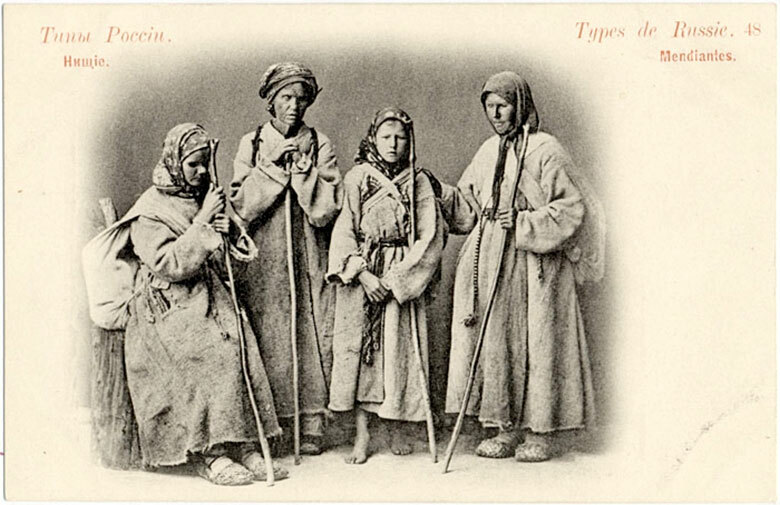 According to one account, in September of that year Nicholas I was traveling in Tver’ Province and “happened to notice, that on the main road many mendicants (nishchie) were wandering” despite the fact that laws strictly forbid vagrancy. As a result, he ordered the Minister of Internal Affairs to see to this problem, the Minister wrote to provincial governors telling them to take steps against vagrancy, the provincial governors wrote to town and district police agencies, and those agencies wrote to large settlements. And so by November, the order to crack down on vagrancy had made its way to Ivanovo. The Ivanovo Estate Administration received a notice from the Provincial Chief ordering them to pay attention to vagrancy. The Ivanovo Estate Administration then wrote to the sotskie (the peasant hundredmen, a kind of village policeman) of Ivanovo (the village was so large it had eight of them) to bring in anyone they found begging in the village. A second notice asked all villagers to turn in beggars, as well. Over the next year, several more calls repeated the call to crack down on vagrancy and begging. One of the startling things about the archival file recording this event is who got arrested (or at least questioned). It was not, in the end, a case of vagrants from all over showing up in the village to beg, but instead a case of local residents begging. By the end of 1843, the sotskie brought in just over 100 beggars for questioning—all of them residents of Ivanovo itself. The report listed all the beggars, their ages, and then statement of who they were and how they lived. Furthermore, it usually included a comment on whether the beggars were capable of living without charity or were truly in need, and at times other statements of their relationship to begging. Most of the beggars (78 percent) were women. Their average age was 58, ranging from 28 to 100 (and most between 50 and 70) (also, virtually all ages were reported in units of 5). Many of the women were widows, a few were soldier’s wives. A fair number of the beggars also had physical impairments of some sort—several were blind, several lacked an arm (or hand) or a leg (or foot), and a few had a mental impairment of some sort (described in the file as безумный or малоумный). Police questioning apparently focused on a number of specific issues. The comments on each beggar usually includes a notice of whether the beggar had a house in the village (most of them (72 percent) did) and whether they had family members (again, most did—87 percent). The register then notes whether the beggar was actually in need of charity. So, for example, the register notes that Irina Petrova, age 60, “does not have a house or relatives and without charity she cannot feed herself.” Petrova was in the minority of beggars, however—according to the register, only 34 percent of the beggars were judged as actually needing charity. Apparently, the police then asked all those they judged not to need charity to swear that they would stop begging. Very few did so. One was Aksinia Arkhipova Shomova, age 65, who “has a house [but] no children—she promised not to wander around the village [begging]” (обещалась по миру не ходить). In far more cases (47 of 50) the register says the opposite: he or she “did not promise to stop begging” (по миру ходить не обещалась). (Also, I’m a tiny bit uncertain about this translation, so if anyone thinks it should be corrected, please let me know in the comments.) That suggests several things. For one, it suggests that being questioned by the police was not actually particularly scary, so they felt no need to agree to abide by official rules against begging. It might also suggest that the beggars actually did have a real need for charity, so could not promise to stop. Many of these entries say nothing more than these few facts, but even so, there’s something very evocative about these glimpses of individual lives. There are certainly more versions of Irina Petrova’s story, of men and women marginalized by old age or ill health. They were figures like Andrei Afanas’ev Liamin, age 65, who did “not have a house, lives with his sister, is old and in ill health” and was judged to be in need of charity. These cases give an image of the limits of communal life in a big village or small town, where life outside a big extended family or after a serious accident could mean extreme economic uncertainty. There are also a few cases that seem rather different in intent. These are people like Katerina Parfenova, age 52, who “lives in an apartment with her husband Makar Mikhailov, who works at the Garelin factory” or Anna Kharitonova Popova, age 45, “who has her own home and two sons, the big one 12 the younger 7 and daughters, the oldest 22, the second 15, the third 9—her husband Osip Ivanov lives with their oldest son Evgraf, 25, in St. Petersburg.” Neither was judged to be in need of aid, and neither promised to stop begging. I wonder a bit if for these women begging was actually a choice, a form of personal agency. They had working husbands, and although Popova had many children, two adult men working in St. Petersburg probably gave her a reasonable degree of financial stability. I’m inclined to agree that they were likely not in need of charity to live. I gave two reasons people might not have promised to stop begging—need and lack of fear of the police. Popova and Parfenova may also have seen begging as a thing they actively wanted to do, despite not having a need to do it. For them, begging may have seemed a better option than work in the factories, or working at home. This entry was posted in Imperial Russia, Ivanovo. Bookmark the permalink.